What is the cost of active RFID UWB tagging students at West Cheshire College? You’d have though some simple questions on cost and funding may have been easy to answer, especially when you are investing in a state of the art, military standard, ultra wideband RFID tagging system for tracking children in real time? It would seem not. West Cheshire College, according to the RFID Journal, started tracking students in 2010 with active RFID tags emitting a radio frequency signal, over 300 feet every second, to sensors around the college to pinpoint the students position to an accuracy within 1 meter – featuring some of most sophisticated RFID capabilities on the market. According to the college, the Chief Executive/Principal, a role held by Sara Mogel, was responsible for the New Buildings project at the College under which the RFID tracking system was installed. So great a return on investment the RFID system proved to be, that the college’s Business Area Services Manager, Kevin Francis, went to Florida, USA, in April 2012 to give a presentation at an international RFID conference of how successful UWB RFID was at tracking kids. Finance – West Cheshire college cannot be clear if the system was purchased, if it was purchased they cannot find the cost. The word “impossible” was used. Implementation – The college does not hold nor can provide any documents or records whatsoever on any discussions about the implementation of the RFID system. Supplier – The college claim they have had no contact with the supplier, Zebra Technologies, at all. Zebra had on their website a video “Optimising the learning experience with a Zebra Location Solution” of the college, staff and students promoting the real time student tracking system. This would seem to highlight that a company can film the college, staff and students without contact with the college at all. Lack of Information – Members of staff that have left have been cited as a reason for the college not being able to provide information under its obligation to the Freedom of Information Act. Staff trip to Florida – West Cheshire College hold no documents or records about sending a member of staff to another continent to present the college’s use of UWB RFID to the RFID industry. The college states that “In such cases there are no costs presented to the college and all matters are settled by the sponsors.” Does this apply to this case/trip? They have no documents on it either way, so maybe not? Who knows? Student Consent and privacy -The college cannot be clear on how consent from students has been gained, whether any privacy impact assessments have been carried out. 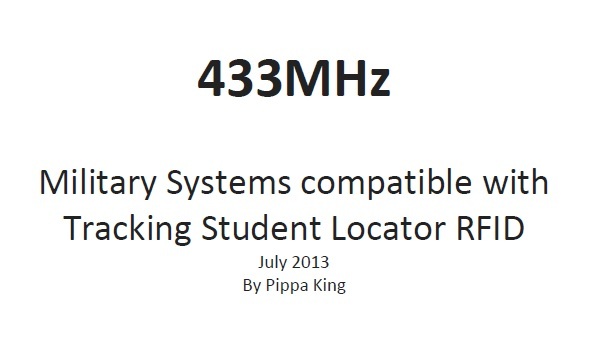 They could not be clear on the specification of the RFID used to track the students. These unanswered questions on consent and privacy, asked under the Freedom of Information Act, are now lodged as an official complaint with the Information Commissioner’s Office. Either West Cheshire College’s understanding of the Freedom of Information Act is extremely poor or the college’s answers under the Freedom of information Act raise some serious questions about what is going on at the college as a whole. If West Cheshire College’s responses under the Freedom of Information Act are to be believed – which they must as the college has obligation under the law to respond truthfully – then practices at the college appear to highlight serious breaches of student consent, privacy, audit trails, accountability, transparency and security. This would be quite astonishing. The seriousness of child/student welfare should be of absolute paramount concern to any educational establishment acting in parentis locus and replies given under the Freedom of Information Act must be taken seriously – to this extent the Information Commissioner’s Office who oversees the Freedom of Information Act and Data Protection Act has been made fully aware of this situation. This entry was posted in Attendance, Civil liberties, Consent, Discussion, Europe, Freedom of Information, Privacy, Real Time Location System, RFID College, RFID tracking, RTLS, Tracking children, UK, West Cheshire College and tagged college, consent, education?, Freedom of Information, Real Time Location System, RFID, RFID children, RFID school, RFID tracking, RTLS, surveillance, Tracking children, UK, West Cheshire College. Bookmark the permalink.